New to the Koh Chang property market, this stylish bungalows resort is now available for immediate sale. 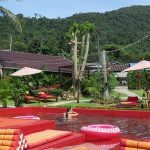 Located on the main street in one of Koh Chang’s most popular quiet areas, the property consists of 11 individual bungalows, owner accomodation, bar, kitchen and small shop. Set back nicely from the road, the resort’s 11 rooms, 6 a/c and 5 fan, all with ensuite bathrooms, are laid out in two facing rows around a well kept garden area. The rooms are built in the traditional island style using wood, bamboo and thatch but have been cleverly modernised using brushed concrete in the bathrooms, mosquito screens on all windows and metal sheeting under the grass roof. Each also has a balcony. The owner accommdation comprises a comfortable a/c sitting room, two a/c bedrooms joined by their own connecting door (ideal for a young family) and large bathroom. The bar area, built in a similar style to the bungalows, has an external counter serving space, with a large storage room behind, used for laundry. At the rear of this building sits a small Thai style kitchen with its own access. The resort offers plenty of space in and around this particular area to develop a restaurant. At the front of the property, a good sized car park allows for two vehicles and motorbikes, while a small shop, currently used for bespoke hammocks, faces the street on one side. All utilities (electricity, internet) are fully connected, with the water supply coming from the metred local source. Alcohol licences are all fully up to date. The resort is listed on booking sites and active on social media. The bungalows resort has an existing staff of 3 together with the owners. All fixtures and fittings are included in the sale, together with one motorbike and a Thai company, whereby new directors can easily be swapped in and the existing directors swapped out. At an annual rate in line with other similarly sized land rentals in the area, the contract length and terms are negotiable, with registration for long contracts at Laem Ngop Land Office an additional option. This bungalows resort for sale is ideal a first-time owner, with everything already in place and up and running – a perfect turnkey opportunity.